Wednesdays @ 9:00 am in Studio C. Bring your energy to this class and get ready for a "rockout workout"! Sign up ahead of time, space is limited to 25 participants. The instructor for this class is Richard. We offer a variety of group exercise classes that will get your heart pumping and build cardio stamina while burning calories. Boot Camp: Boot campers get ready to work! Sprints, push-ups, burpees, drills, core strengthening and more will build strength, stamina, conditioning and all around awesomeness! This exciting and very challenging class uses lots of different ways to keep you strong and fit. Let's get sweaty! Power Abs: This class will improve your strength, posture, balance and flexibility with exercises based on the principals of Pilates, yoga and traditional strength training. These classes sometimes incorporate the use of bands and balls. Foam Roller: This class uses the foam roller to help relieve tension in your muscles and connective tissues, plus it will help improve your balance and strength. It hurts so good! Group Cycle Classes: Group cycle is a great cardio workout and is appropriate for all fitness levels. You can adjust your workout to match your personal fitness level. The instructors will lead you on a ride designed to improve your fitness on a variety of levels: Endurance, Strength, Interval and All-Terrain. Hip Hop: Get your groove on with this fun filled cardio dance workout! Hip hop fitness combines simple dance moves with upbeat music for all ages and fitness levels. You won’t even feel like you are working out! Total Body Conditioning: This class is a combination of cardio, strength, conditioning, agility, balance and stamina, using various forms of challenging exercises. KIckboxing combinations, tabatas, intervals, body weight exercises, boot camp drills and more are performed during this fun, challenging class. Get ready to work! Mommy Boot Camp: Provides new moms and mothers-to-be a chance to get into shape, while watching their baby or young child. Children will not participate in class, so they should be in a stroller or be self-sufficient. Safety of the older children attending is the responsibility of their parent. Please get 6 week clearance from your doctor prior to attending. Class includes cardio and strength training. All levels are welcome! Be ready for a challenge and enjoy the chance to network with other mothers. Piyo: PiYo is a fusion style strength and flexibility mat class. It combines Pilates, Yoga and strength condition in a flowing sequence designed for those who like to move with grace and power. Pump Iron: This is group weight training at its best. This class uses a barbell that ranges in weight from 5 to 40 lbs. You build strength, stamina and develop a leaner body. Free weights, bands, medicine balls, bosu balls, and stability balls are also used in this class. Silver Sneakers-Classic: Have fun and move to the music through a variety of exercises designed to increase muscular strength, range of movement and activities for daily living. Hand-held weights, elastic tubing with handles, and a SilverSneakers ball are offered for resistance. A chair is used for seated and/or standing support. Friday’s class focuses more on stretching, posture, balance and relaxation. Silver Sneakers Circuit: Combine fun with fitness to increase your cardiovascular & muscular endurance power with a standing circuit workout. Upper-body strength work with hand held weights, elastic tubing with handles and a silver sneakers ball is alternated with low impact aerobic choreography. A chair is used for standing support, stretching and relaxation exercises. Step: For a more advanced cardio class try this fun, upbeat challenging workout! 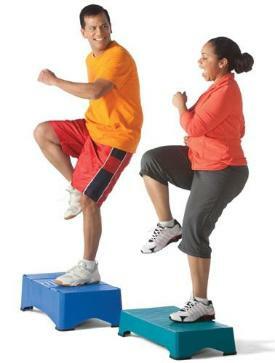 A high intensity, low impact aerobic program, step involves stepping up and down on an adjustable platform while performing a variety of movements and routines. Some classes use a bosu. Stretch & Flex: Stretching and range of motion for the muscles and joints of the body. Class time is used to help strengthen core stabilizing techniques to build a stronger and more flexible body. Stretch, Move & Balance: This class is designed to relax and de-stress from the everyday world. Most of the work is standing with the warm-up and cool down using the chair. Be prepared to enjoy a multitude of movement incorporating, Tai Chi, Qi Gong, yoga, balance, breath work, stretch and relaxation. This is truly a Spirit, Mind and Body class. Tabata: These are high intensity interval training classes. Classes vary, but all follow a work/rest protocol. Example: 20 seconds work:10 seconds rest. Classes may use body weight only or add dumbbells, bands and balls for added fun. They are fast paced and can be modified for all fitness levels. Be prepared to sweat! WOW - Women on Weights: Great for the beginning exerciser, W.O.W utilizes hand held weights, bands, balls, tubing and body weight to tone and strengthen the body. Y- Fit: Low impact aerobics at its best. This class is a traditional low-impact class with warm-ups, cardio section, and standing or floor strength work, and stretch. Yoga: Yoga is a style of movement utilizing different poses which can work to increase strength, balance, flexibility and mental focus. We offer a variety of Yoga styles so please refer to the schedule for specific class levels. Zumba™: Add a dollop of salsa, dash of calypso to a slice of merengue stir the mix to Latin music and they call it Zumba! A dance exercise workout. Be ready to sweat to Latin rhythms. If you are new Zumba, the Friday class is a great start for beginners.